For all of you Surveillance Operatives working in hot climates, here is an idea that will keep your surveillance van, car or four wheel drive cool. The system uses ice water circulating through a cooling element. Air is then drawn over the element and circulated through the vehicle. This particular system is portable and can be transferred from vehicle to vehicle. 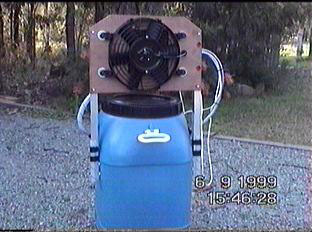 This is a rear view of the cooler which depicts the cooling element and piping etc. This element was obtained from the wreckers for the sum of $15-00. The element is a heating element from a VK Holden Commodore. The side view of the cooler. Note the large black bulkhead fittings in the bottom centre of the photo used to pass the hose through the container wall. This internal shot shows the suction and return line setup. A marine bilge pump is used to pump the ice water through the cooling element. This element is rated for continuous use and cost $136-00. You can purchase cheaper ones for about $40-00, however, they are not rated continuous. This shot shows the bilge pump. Note the flattened copper pipe used to restrict flow to the cooling element. This will have the effect of slowing flow and making the ice last longer.